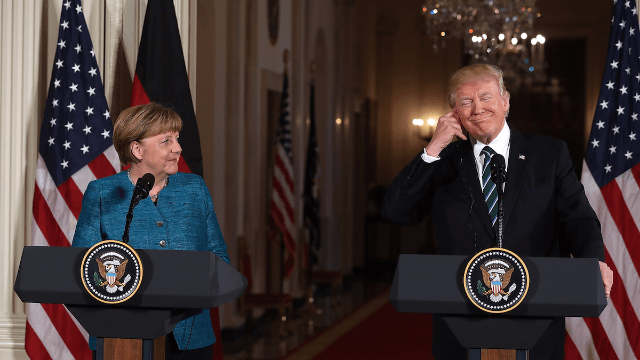 Trump finally tells his version of the time he refused to shake Angela Merkel's hand. Remember that time Trump seemingly refused to shake Chancellor of German Angela Merkel's hand? So much has happened since then, but let's go back to that day in March and revisit the events through the eyes of the President. Because today, during an interview with the about his first 100 days in office, Trump told his version of the events. "And I guess somebody shouted out, 'Shake her hand, shake her hand,' you know. But I never heard it. But I had already shaken her hand four times. You know, because we were together for a long time." Yes, they were together for a long time. It must have been hard for them to end things after shaking hands four times...breaking up is never easy, especially after that level of vulnerability. It's truly a shame that the public had to misconstrue the special thing they shared. But hey, they'll always have that time together and no one can take that way from them. I like to imagine the day, years from now, when Trump is no longer President, the ice caps are but a distant memory, yet somehow Merkel still has that bowl cut. The two of them will run into each other in a cafe in Berlin—Trump is there on business, he's a washed up motivational speaker now, and buying himself a cookie before he heads to a sagging auditorium to deliver a half-hearted speech—and they catch each other's crow-footed eyes. "Those cookies are good," Merkel will smile. "I've heard very good things," he'll say, nervously crinkling the wax paper encasing his cookie before venturing, "hey, you want to grab a drink, catch up while I'm in town?" "Oh, that sounds nice," she'd say, but her eyes would betray her—the hurt welling up, old pain returning to the surface. "I'm here 'til Thursday. Call me," Trump will say, before slouching out of the cafe in his poorly tailored suit. But she knows better than that. She'll never call.